On November 16, 2011 at about 5:30 p.m. a dear saint of the Lord stepped into the Lord's presence. 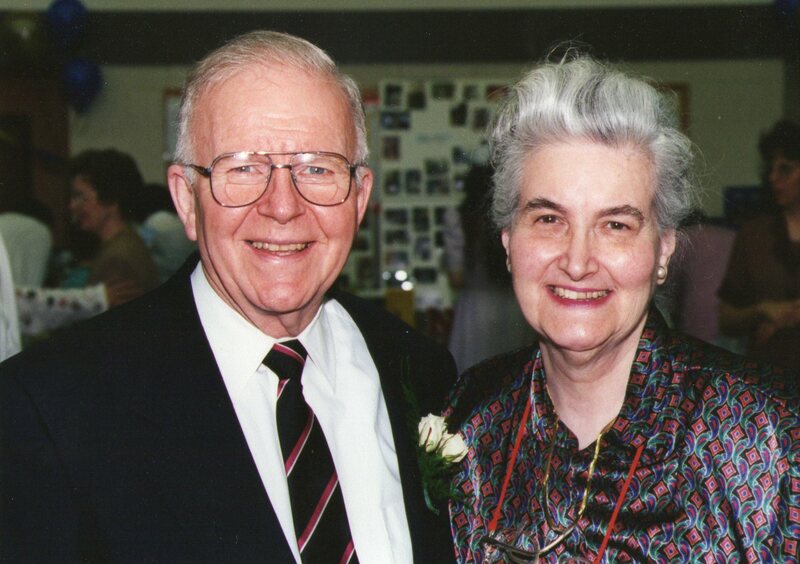 Margie Blackwood (June 30, 1925 - November 16, 2011) was known and loved by countless members of Second Reformed Presbyterian Church and others. Though I had not visited "Mrs. Blackwood" in several years, I wanted to bear witness to the important role she played in my growth and formation as a boy and as a Christian man. Margie Blackwood was the quiet one of the Blackwood family:) Her husband Roy Blackwood fulfills a strategic and far-ranging ministry in the kingdom of God. He was able to do so precisely because the Lord in his grace had blessed him with a "helper that was meet" for him (Gen 2:18,20). My earliest memories of Mrs. Blackwood were seeing her joyfully settled week by week in the "old sanctuary" of Second Reformed Presbyterian Church. I watched her (probably stared at times!) as a little boy during church. She absorbed the preaching of God's Word. Her face shone as she sang God's songs to him. Margie was a quiet and gentle presence in the congregation of my childhood throughout the first two decades of my life. She was present the day of my baptism in 1977, She encouraged me at my highschool graduation (pictured) in 1996. She whispered a blessing in my ear at my wedding in 2002. In the blessing of God I grew from my infancy in the visible church of Jesus Christ, and Margie was a constant incarnation of noble, virtuous womanhood. One of my favorite memories of Margie was her playing the piano. She was the one who taught me to improvise. I remember being absolutely amazed at how she could take any tune she knew and turn it into a gorgeous piece on the piano -- all by ear. Her husband (Roy) and my father (Rich) would often come to the church building for meetings on Lord's Day afternoon, so Mrs. Blackwood and I would spend precious time together talking and playing the church's old, black piano. I remember on several ocassions traveling to the Blackwoods home in Zionsville to mow and trim trees and weed flower beds. I learned that not all flowers come out of a pot, and that Mrs. Blackwood loved wild flowers. Especially when I got interested in one of Dr. Blackwood's many secretaries (Sue) I was a regular visitor in their home on Princeton Place and had delightful times of fellowship and psalm singing at their little round table in the kitchen. I entitled this post "Mother Margie" because from the vantage point of years, I now see this woman's fruitfulness. I never saw her as a physical mother. Bill and Bob and Beth were all grown. However, I DID see how over many years she served as an important mother figure for ladies (and men!) who came and went. Some came from the broader RP church. Others came through various Navigator connections. But as a fly on the wall I was blessed to observe a mature older woman imparting Christian doctrine and life to a host of younger women. Some are now godly mothers and grandmothers. Some moved on beyond my horizons. However, Margie taught each woman she met good lessons, and "trained them to love their husbands and children, to be self-controlled, pure, working at home, kind, and submissive ..." (Titus 2:4-5). I will be forever grateful of this childhood example of spiritual mothering within the local church context. Above all, I remember "Covenanter Hour." On Lord's Day evenings Mrs. Blackwood -- who had taught in the Indianapolis Public Schools for many years -- would take us young and squirmy kids aside. It was through Mrs. Blackwood's efforts that I first became acquainted with the Westminster Shorter Catechism, and with the thrilling Covenanter Stories from the moors of Scotland. It was here that I was trained by a godly teacher to understand the Gospel of Jesus Christ. It was simply a given the Mrs. Blackwood loved Jesus more than anyone else in the world, and she wanted us children to know him too. On at least two ocassions Mrs. Blackwood spoke about heaven during Covenanter Hour, and I remember understanding that someday I would leave this world (which had bad things in it) and go to a place where there were no bad things at all. And I would see the face of Jesus (Rev. 22:4). Several of my dearest friends bear witness that their hearts were regenerated during Covenanter Hour through the quiet and insistent teaching of this dear woman. The words of the Apostle are fitting to describe Margie's life: "We speak, not please man, but to please God who tests our hearts ... we never came seeking glory from people ... we were gentle among you, like a nursing mother take care of her own children ... because you had become very dear to us" (1 Thess. 2:4-8). I always knew that I -- and each person to whom Margie spoke -- was loved by this remarkable woman. At the risk of seeming trivial, I wanted to relate a closing story about how this dear woman affected my heart -- and I dare say the hearts of hundreds. In the summer of 2010 our family stopped at the Focus on the Family on the way home from the Horn Creek RP Family Conference. Phil Vischer was there signing autographs, so we had a family huddle and decided to purchase "What's In The Bible With Buck Denver" and get it autographed. After a screening from dad, our family sat down to watch it. I pointed out the "Sunday school lady" in the film, and told my children about Mrs. Blackwood. I told them then -- and tell you today -- you ought to pray the Lord provides you with a quiet, faithful "Sunday school lady" in your life. Like Margie Blackwood. Share a memory and testimony to God's grace.